Successfully Added Android TV Box + Soundbar - Quad Core Android 5.1, 4K, DVB-T2 Functionality, Kodi V16 Pre-Installed, 50W Audio Output (Grey) to your Shopping Cart. On the lookout for a 4K quad core TV box TV box that has something a little more to offer? Meet the KS2 – a completely 4K-ready Android TV box with built-in speakers that help add a little bit more bite to your audio! The KS2 is a 4K Android TV box, which an excellent tool for adding 'smart' functionality to plain old television sets. It lets you run a variety of apps, from built-in apps like the Kodi V16 media player, that streams video content, to a wide variety of games that you can find on the Google Play Store. In a nutshell, the KS2 is an Android 5.1.1 TV box that gets the job done. The updated version of Android Lollipop is a slick, easy-to-use operating system with a variety of quality-of-life improvements such as Android Smart Lock and Screen Pinning. The best part, however, is the hardware that makes up the KS2. The Amlogic S905 Quad-Core ARM processor coupled with 1 Gig of RAM and a Mali 450 graphics processor all work together to support 4K resolutions. This lets you hook the KS2 up to huge TV screens and still churn out video that's crystal clear! And don't forget the twin 2.5-inch speakers paired with a 3-inch woofer that runs the length of the KS2. These additions help produce richer, deeper, and more powerful audio that's a significant step-up from your average TV's speaker system. 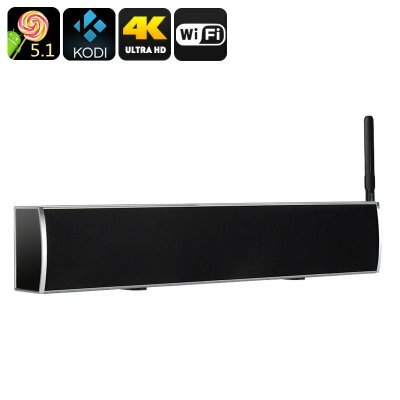 This makes the KS2 an Android TV box with woofer and speaker system for transforming spare computer monitors into fantastic TV screens! Another strong point of the KS2 is that it does so much more than your average TV box. Aside from the fact that it's a 4K TV box with speakers of its own, it also conforms with the DVB-T2 television standard. In short, it lets you access digital broadcast transmissions used by the TV and cable companies of today. This lets you hook up digital channels on your TV box to watch content from your local and national TV channels. But that's not all! The KS2 also connects to the Internet via Wi-Fi and to other devices via Bluetooth. It can hook up with other PCs, tablets, and smartphones that utilize Miracast and Airplay wireless display standards. All these features help the KS2 "play nice" with the other gadgets in your home, from your Windows desktop and Apple iPhone to Bluetooth headphones and wireless keyboards. The KS2 TV box sound bar comes with a 12-month warranty, brought to you by the leader in electronic devices as well as wholesale Android TV boxes..